Merlin Cottages Self-cateringMerlin Cottages has Merlin House (8 people), Merlin Barn (6 people) and High Barn (5 people). 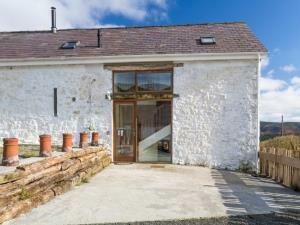 It is 4 miles from Llandovery in pristine countryside adjacent to a working livestock farm. These self-catering properties are fully renovated with a shared Garden Building with Games Room. It is a great location for mountain bikes, walking, star-gazing and birdwatching. Merlin Cottages has Merlin House (8 people), Merlin Barn (6 people) and High Barn (5 people). It is 4 miles from Llandovery in pristine countryside adjacent to a working livestock farm. These self-catering properties are fully renovated with a shared Garden Building with Games Room. The property is located near to the A40 East to West road through Mid Wales. Travel along the A40 to a point 2 miles East of Llandovery and you will see red “B & B” signs. Turn into a minor road signposted “Babel 2”. Proceed over a bridge and keep left. After 2 miles you will see a sign on the left “Babel”. Drive for a further 0.3 miles and turn left (just before the village hall). After 0.4 miles, turn left into Penywaun. The postcode SA20 0AX works well with Tom-Tom satnav. External doors have automatic lights. The front door has a step of approximately 150mm and the rear door has a 50mm threshold (if required ramps are provided by arrangement at the time of booking). Ground floor doors are 0.80 to 0.83m wide. First floor internal doors are 0.76m wide. Sockets/Lightsts meet latest Building regs on accessibliy. TV, DVD and HiFi have remote controls All bedroom windows comply with means of escape fire regulations.